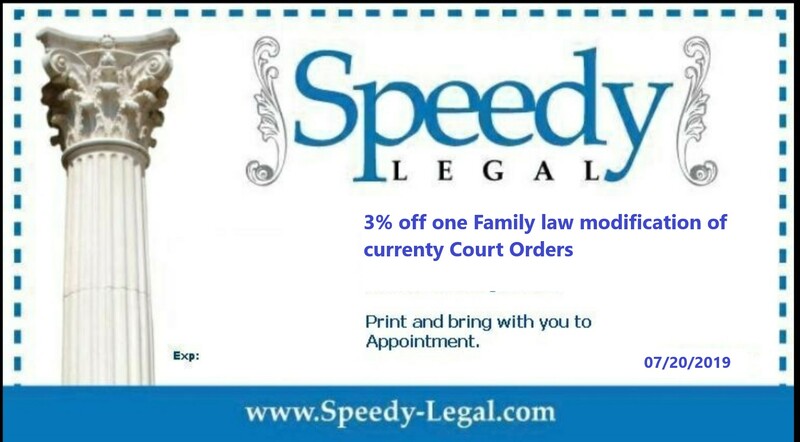 3% OFF 1 PHASE OF A MODIFICATION OF CURRENT FAMILY LAW COURT ORDERS. Call Speedy Legal, leave us a message with your phone number, or email SpeedyLegal@aol.com. Always give us your first name and phone number so we can contact you. See you soon. Special ends July 20, 2019. Print this coupon and bring it with you! Welcome to your discount page! We at Speedy Legal understand everybody goes through hard times. We try not to further burden our Speedy clients with high fees or large payments. We also try to assist you by offering coupons lowering your costs and implementing discounts for signed clients. Click the above coupon for current offer. Print and bring in with you on your first appointment that applies to the offer.